Lauer denigrated Palin's qualifications as he asked: "When you were plucked from obscurity in 2008 you'd been Alaska's governor about two years. You didn't have any real experience on the national stage....Do you think, if Mitt Romney's the nominee, he should choose someone with more experience on the national battlefield than you had at the time?" The GOP ticket, to tell you the truth, Matt, doesn't know what's coming. They don't know what's going to hit them in terms of double standards being applied to them and the positions that they hold, and the records that they are running on, from, you know, personal family issues to anything else. There will be that double standard applied no matter who it is. Concluding the segment, Lauer took a parting shot as he referenced Palin's guest hosting the show in the next hour: "And I want to mention to people, you are going to stick around and join us for our 8:00 hour, which technically makes you part of the lamestream media for that hour. I just want you to know." On Monday, NewBusters' Geoff Dickens detailed some of the worst Today show bias against Palin over the years. LAUER: If Mitt Romney is the nominee, one of the first real major decisions he'll have to make is on a vice presidential candidate. When you were plucked from obscurity in 2008 you'd been Alaska's governor about two years. You didn't have any real experience on the national stage, and in this era of intense media scrutiny, you took some lumps. You had mixed results, as we all know. Do you think, if Mitt Romney's the nominee, he should choose someone with more experience on the national battlefield than you had at the time? PALIN: Well, you know, I would put up my record as a CEO of a city, of a state, as an oil and gas regulator, up against any of the other potential GOP vice presidential nominees last go-around. So you know, I'm proud to stand on my record as a private sector, and a public servant CEO. LAUER: But if you were advising Mitt Romney, would you say go out and get someone who is battle tested on a national level? PALIN: I would say it doesn't matter if that person has national level experience or not, they're going to get clobbered by the lamestream media, who does not like the conservative message. And it doesn't matter if that person has been a known commodity to the mainstream, lamestream media or not. What I would advise Mitt Romney, or whomever the nominee would be is, don't necessarily play it safe, and do just what the GOP establishment expects them to do. And that is, to get somebody kind of just going along to get along, not willing to go rogue and shake it up and say that we need relentless, and we need sudden reform of our government to put it back on the side of the people. 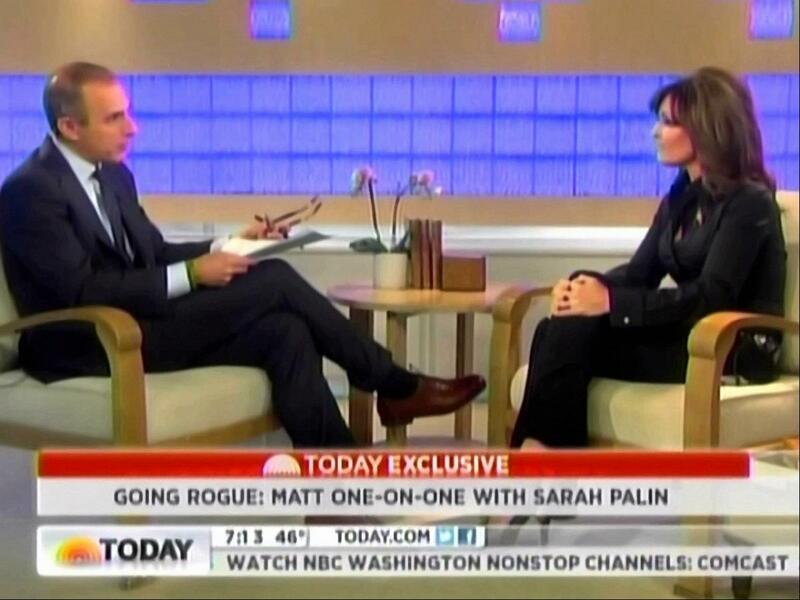 LAUER: Governor Sarah Palin. Governor, thank you very much. I appreciate it. LAUER: And I want to mention to people, you are going to stick around and join us for our 8:00 hour, which technically makes you part of the lamestream media for that hour. I just want you to know. Nice to have you here.